Nowadays, videos are getting more and more popular due to the development of technology and Internet, which is illustrated through the figure of 72 hours of videos uploaded to YouTube every 60 seconds. It means that you can easily publish your videos. However, at the same time, you also find it difficult to get attention of viewers to your content. 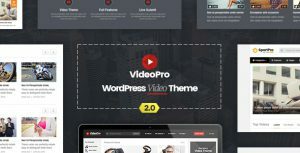 Good news for WordPress users is that they can now take all worries out with WordPress video themes since they can provide users with amazing sites to present awesome videos. All you need to do is choosing a theme that can create a lasting impression on your visitors to guarantee they will frequently visit your site. The following given tips will be useful for you when picking a stunning theme for your video website. There are a bunch of devices and browsers, and you are incapable of forcing your visitors to use a particular device or browser compatible with your theme. The perfect option is choosing a theme that supports a large number of popular browsers. Also, when you choose a WordPress video theme, responsive design is another factor that you should consider. Because responsive WordPress themes for video will help your website adapt to all screen sizes. It should be much better if you can use a theme available on mobile as more and more people are using smartphones to watch and share videos these days. Thus, always bear in mind that the more highly compatible theme you select, the more visitors you attract. It is necessary to choose a SEO friendly theme if you want your videos to be known by a large number of audience. You are expected to focus on the SEO features and code of the theme to make sure that your contents can reach high-ranking on Google search result page and be watched by many people. Not all of your viewers are master at technology, so your website is expected to possess a user-friendly theme to gain the largest number of visitors. You should choose a theme using friendly elements to bring your visitors the most pleasant experience. Besides, themes compatible with WPML Plugin are the perfect choices as they provide full translations to help you create multilingual websites for people from various countries. If your website is beautiful and impressive, it will likely attract a lot of audience. You should also review responsive WordPress themes for video that has many personalization choices. Those will give you more opportunities to make your website stand out. Special features are to help you run your site effectively and leave your viewers with an unforgettable impression. The theme should be able to present a stunning and neat portfolio of your works to make it easy for your visitors to find the videos on your site. Basically, it is supposed to allow you to showcase your content in Channels and embed video URLs from well-known video hosting sites. You should also consider your own purposes to choose themes with exclusive features, such as advertisement plugin, counting view and video rating plugin, etc. Additionally, never forget to select a theme that helps you create forum on your site as well as share your content on popular social network sites. It is extremely important that you choose a theme that provides full support at any time and is updated automatically to avoid bugs. The five tips mentioned above are the keys to success in choosing an impressive WordPress video theme. Based on these tips, True Mag is considered one of the most leading themes, which has gained trust of more than 3000 users. You can try its demo right now with just one click and own it for only $59.